We supply a wide range of compatible and branded thermal transfer ribbons to meet any labelling requirement. From general-purpose wax to high-performance resin, our high quality ribbons are suitable for direct marking and inline printing applications. We can supply ribbons for the following printers; Astromed, Avery Dennison, Datamax, Domino, Epson, HP, Intermec, Labelmate, Microplex, Novexx, Printronix, Primera, SATO, Toshiba Tec and Zebra. We ensure that our thermal ribbons are matched to both the performance requirements of the label material to be printed and the thermal transfer printer on which they will be used. 100% compatibility is critical to successful label printing. The most economical choice for general purpose tag and labelling applications including shipping, warehousing, retail, textile, and apparel. Wax ribbons are used when printing on uncoated and coated paper tags and label stocks, and low end filmic labels. This is ideal for identification purposes only and will be thrown away as part of the packaging. The best choice when a higher level of scratch, smear or mild chemical resistance is needed in labelling applications. Premium wax/resin ribbons print well on coated paper tag and label stocks, low end films, and even some polyester labels. 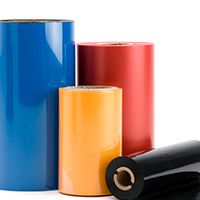 Wax-Resin ribbons print on a broad range of label stocks and have excellent image durability. Best for harsh environments labels requiring resistance to abrasion, heat or chemicals. Applications include chemical drums, electronics, pharmaceutical, medical device, automotive and industrial use. Resin ribbons are compatible with high-end synthetic films such as polyester and polyamide (Kapton). Or if you are unsure of what type of auto label you require, please contact our team who will be able to assist on +44 (0) 1189 364444 or submit an enquiry.